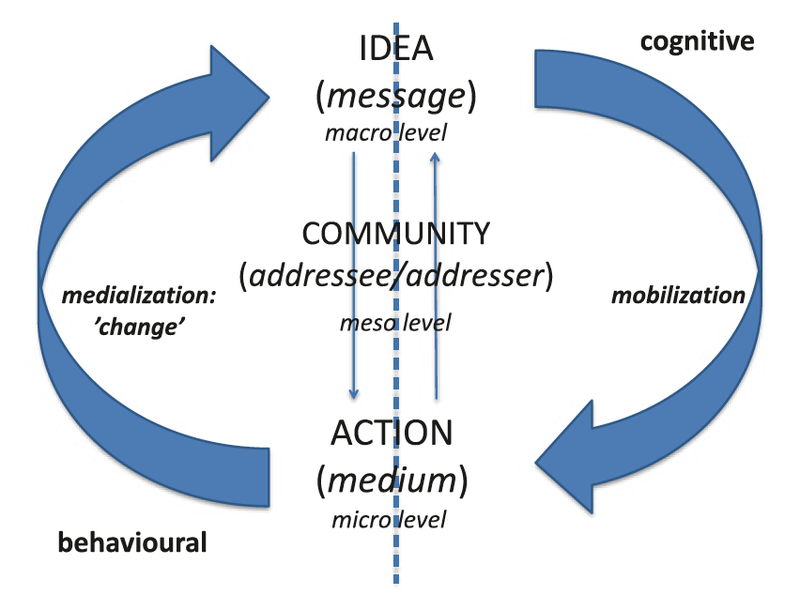 Caption: Moving from idea to action, cognitive and behavioral levels of radicalization (Önnerfors 2018:27). The far-right terrorist attack of Christchurch was staged ‘in real life’ (IRL) with the purpose to create maximum impact through dissemination online. Facebook is said to have removed no less than 1,5m videos of the terror attack during the first 24 hours, which demonstrates the magnitude of terrorism as an act of strategic communication (Falkheimer, 2013:44-55)or as Marsh and Mullholland argue: “the attack seemed orchestrated for the social media age” (CNN 2019/1). Tarrant thus has much in common with ISIS who painstakingly staged their executions as emblematic hybrid media narratives with the purpose of a maximum of impact (Krona 2019). Caption: Title page of Tarrant’s manifesto, a circle with 8 subsections, titled clockwise ‘environmentalism’, ‘responsible markets’, ‘addiction-free community’, ‘law & order’, ‘ethnic autonomy’, ‘protection of heritage and culture’, ‘worker’s rights’, ‘anti-imperialism’. In the center of the circle, we find the SS-symbol ‘Schwarze Sonne’ (‘Black Sun’). The invaders are currently superior when it comes to fertility, but also socio-cultural cohesion and traditions. In a retrotopian sentiment, Tarrant laments the decline not only of Western birthrates, but of Western civilization as a whole, which apparently has gone off the tracks through industrialization, modernization and capitalism and the destructive ideologies of liberalism and ‘nihilism’. The worst kind are however those who give up their own origins, for instance converts. 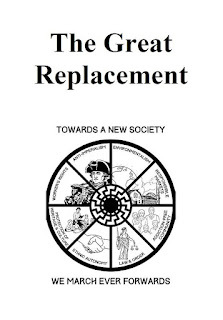 • The terrorist act is interpreted against the great frame narrative of white genocide: fight against invasion and revenge for previous terrorist attacks and warfare stretching back to the loss of Constantinople in 1453 and the Crusades. 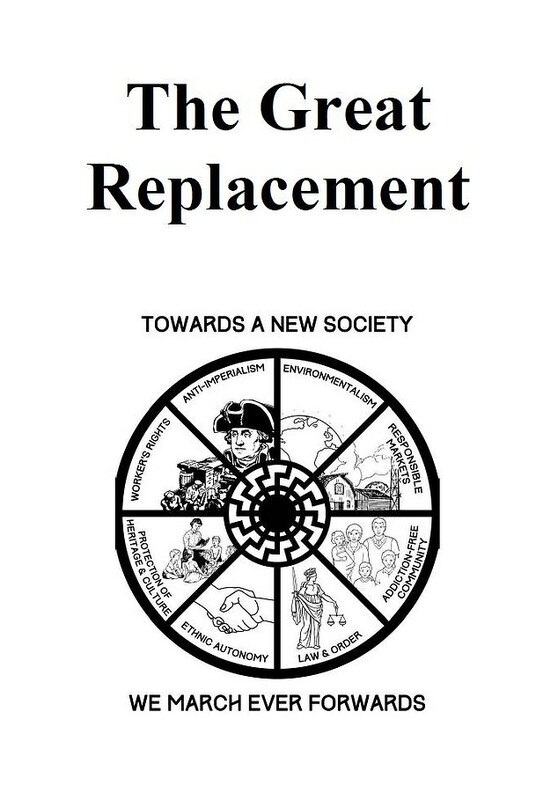 • Tarrant consciously aims at to incite violence, he claims, and to further societal divides. • The inner enemy is the ‘nihilistic, hedonistic, individualistic insanity’ in Western thought. • Tarrant wants to split the NATO between Christian and non-Christian countries, he is clearly anti-Turkish. • His aim is also to incite violence in the US by fueling the controversy over the 2ndamendment with the ultimate aim of civil war, balkanization and the destruction of the ‘melting pot’-ideal, the racial (spatial) division of the US into white and non-white territories. The issue of indigenous populations is not addressed. • Tarrant says that two game-changing events for him were the Swedish terrorist attack of April 2017 and the French general election of the same year. He expresses hatred of Macron, but likewise of Le Pen. Swedish candidate for MEP Sara Skyttedal of the Christian Democrats repeated exactly this ideological position in an interview only a day after the terrorist attack (DN 2019). • Was the terrorist attack a part of strategic communication? Tarrant is ambiguous/contradictory. One the one hand he says that it was not a PR-stunt for his ideas, on the other hand he says that the media impact matters. • Tarrant’s travel account of unease through France where he realizes that the ‘invaders’ are everywhere and that the lives lost in WW1 not are remembered (forgotten sacrifices of freedom). • Tarrant says he was in contact with the ‘reborn Knights Templar’ around ‘Knight Justiciar’ Breivik, whom he admires deeply. • Christians ought to align with the anti-Islamist views of pope Urban II who started the crusades. • Pro-Trump (‘symbol of renewed white identity’) and Pro-Brexit. • There are elements in the manifesto as well as displayed during the terrorist attack that suggest Tarrant had contacts/sympathies with violent islamophobic extremists from the Balkan countries. • Back side: a collage of eight color images, heavily masculinized and feminized imagery together with the idealization of natural purity, martial ideals, the benefits of rural life and traditional/natural gender roles. I don't suppose you could post a link to the actual manifesto? It's not that I don't trust you...but things are much better refuted or understood from source material. Exactly. It comes across like he just wants to cherry pick parts of it to support a narrative if he doesn't reference the actual manifesto.